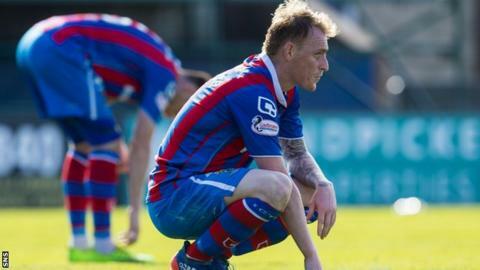 The buck for Inverness' precarious Scottish Premiership position stops with the club's board, says former Caley Thistle midfielder Barry Wilson. Inverness are four points adrift at the foot of the table, with only one league win, and 12 points, in 21 matches. Wilson fears club stalwart - but rookie boss - Richie Foran was handed the reins last year to save money. "When Richie got the job, was it a decision based purely on finance?" Wilson told BBC Radio Scotland. "Richie could be a really good coach, we don't know, but there's no real experience there. "He didn't get to pick his own assistant, Brian Rice was under contract and quite rightly decided to stay. It was always looking like a car crash. "The buck stops with the board. They made the appointment, they took the gamble and, at the minute, it's certainly not looking as if it's worked. "Richie needed his own man in there as an assistant, he wasn't granted that, so there had to be a partnership between Brian and Richie - and I don't think that's there. That doesn't help." Wilson, who made more than 250 Inverness appearances in two spells at the club, branded the current contingent "the worst Caley Thistle team I've ever seen" on Saturday's edition of Open All Mics on BBC Radio Scotland. The 45-year-old says the Highlanders' impotent attack, and the lack of quality service to striker Billy Mckay, has left their top-flight status in severe jeopardy. "The stats back up what I said," he said on Monday. "I think it's the worst season in the club's history. "They've been relegated once before and, even then, they had more points than they have now. "It's been a gradual build-up and I get frustrated watching them, because the lack of quality and creativity in the final third is the reason they're bottom. "The supply Billy Mckay's getting is nothing short of woeful. It really is. "They've got wide players like Jake Mulraney, Larnell Cole, Billy King - they just haven't been good enough. "The strikers are working off scraps, long balls through the middle. And that's the worrying thing, they're not scoring goals. "On Saturday, they were the better team in the first half (in the 3-0 loss to St Johnstone) but never really looked like breaking down a well-organised defence and you just can't see a way out. "Dundee have lost their last six games, but Inverness have only caught up three points in those six games with three draws. One win in 21 is nowhere near good enough." Struggling Caley Thistle now face second-bottom Motherwell on Saturday, when victory at Fir Park would ensure Foran's side clamber within a point of the Steelmen. Inverness' last away league win came in Lanarkshire, when they left Fir Park with a 3-0 triumph, but that was more than five months ago, on 26 October. "Saturday's an absolutely huge game," Wilson added. "The fact they're only four points behind Motherwell is probably more good luck than anything else. "So many points have been lost by clubs this year that they're still in with a chance, but one win in 21, you wonder where they're going to get that result to claw themselves back on to the coattails of the likes of Motherwell. "If they could get into the play-offs, they'd bite your hand off right now, but even that looks a long way off at the minute."